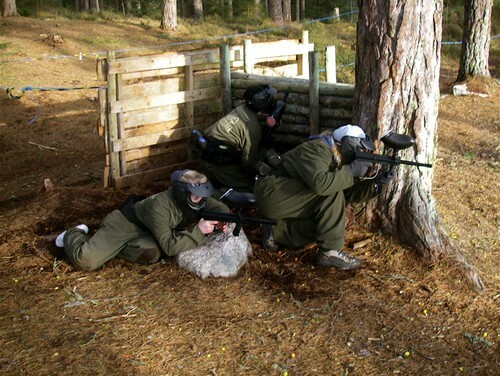 Saturday 24th January – S3 and S4 pupils, along with some staff visited Wildwoodz near Tore and played Paintball all day. Tiring, but great fun. No serious casualties but I think we all had our eyes opened to the futility of trench warfare! FutureChef 2009 – Well done to Rosie Smith (S3) who came third in the regional final of FutureChef 2009, held in Inverness College on Wednesday 16th January. This followed on from winning the school heat and then winning the local heat in Inverness before Christmas. Rosie got support from many locals and would like to thank everyone that helped her with Future Chef 2009. Dan Hall, her Mentor Chef, from Pool House; Williamson’s Food Service for supplying a lovely set of chef whites and most of the ingredients; Jane Grant from Isle Ewe for the scallops and Ritchie’s of Aultbea for the black pudding in particular. Rosie was interviewed about her success by Two Lochs Radio. The Young Quality Scot Award is a partnership between Quality Scotland and ten councils across Scotland. The Award recognises and rewards the efforts of young people to improve the quality of life in their communities. To be entitled to the award you must be, 16 to 19 years old and actively involved in trying to make a difference to your community by yourself, with friends or through a club or other organisation. This year the school nominated Meghann Richardson (S6) for her work in school, at the Den and as a member of the ATC. Meghann has just been told that she has been successful in attaining the award. Well-done Meghann! Last year Becky Massey was nominated and received the Award. Meghann was inteviewed about her success by Two Lochs Radio. More Pupil Success – Isabella Claydon (S3) and Peter Banks (S1) have been invited to join the Highland Swim Team Junior Development Squad. Having achieved the qualifying times they now train 5 times a week in Inverness. This involves keeping a log of what they eat and recording what they achieve at the swim sessions. This is quite a commitment and many hours of traveling! Thanks to Ms Gulliver for organizing this trip. Gairloch High School Calendars 2009 and Oliver DVD – We still have some of these left for sale in school. Calendars are £5 from the office. A very few copies of the Oliver DVD are also still available for £5. Malawi Link Schools Letter Exchange – Once again pupils have the opportunity this term to exchange letters with pupils at Mlozi School in Malawi. The theme for this exchange is “Three great things about my country” and letters have to be ready to send by February 2nd. Last term, every pupil from Gairloch who wrote a letter received a letter back from a pupil in Malawi and these provided an interesting insight into the lives of children in a very different culture. We are encouraging all those who wrote last term to write again and those who didn’t write before are also encouraged to do so this time if they wish. Advice on writing the letters is available from Dr Caley and parental support for children is welcomed. Some of the drawings sent last term by pupils in Malawi are now on the noticeboard outside the library for members of the community to view. Inter-house hockey – The girls’ inter-house hockey tournament was played after school on Wednesday4th January. It was a bitterly cold afternoon and the girls showed great spirit in turning out for their houses. In the senior competition, the Maree girls were confident winners, with Kerry 2nd and Tollaidh 3rd. The Maree team prevailed in the junior competition too, but with Tollaidh 2nd and Kerry 3rd. The combined points mean that Maree won the tournament with Tollaidh and Kerry sharing 2nd place. All players showed determination and good sportsmanship. S5/6 Prelims – Timetables have been issued. Pupils in S5/6 should be working hard now preparing for these exams, which start on 27th January. They have been given appropriate materials for their subjects and advised about the steps they need to take to achieve their best grades. We would ask that parents support pupils in preparation for these important exams. Upcoming dates – French Trip instalment of £100 is due in by the end of January. Stalls and Competitions and the BIG Raffle! Items for the sale can be handed to any member of the school, delivered direct to the Community Hall on Friday 13th March between 3.30 and 6pm or collected by us – call the school office on 712275 and leave your details. Staffing – Staff and pupils were saddened at the passing of Mrs. Sheona MacDonald, just before school broke up for Christmas. She was valued member of staff who gained the love and respect of all who knew her. Sheona will be missed dearly but never forgotten. As a result of Mr. Caddell’s retiral Mr. Graham Milner will take over as acting head of Pupil Support. Mrs. Beatrice Somers will take over as acting Head of Kerry. Christmas Evening – As a result of staff and parents from both the High School and Gairloch Primary teaming up, the hall filled to capacity on Monday 15th December. Music by secondary pupils and plays presented (and starring) all the primary children were very well received. There was lots of talent on show and all present enjoyed a grand Christmas night. School Dance – On Tuesday 16th December the school held its annual Christmas Dance and as always it was a great success. Thanks are due to many people – the dance is a wonderful example of the on-going support we get from the community. The majority of the help we get in time and effort is offered freely to the benefit of our pupils who pay only £4 to cover costs. A major contribution comes from MacKenzie & MacLennan at Gairloch Garage who provide all transport and drivers for the night. We are extremely grateful for this commitment as it allows many of our pupils who would otherwise have great difficulty, to get to and from the dance. We are also grateful to Gairloch Estates for providing the Christmas tree. Many others contribute including all the staff and family who assist in providing food at interval. Pupils are involved in creating decorations and the production and sale of tickets with help from staff. A large group of pupils piped us off to a rousing start and others provided interval musical entertainment. It was a grand night out so our thanks also go to the Community Hall Committee for making the Hall available and all the members of the band who kept the dancing going. Click here for the photos! Whole School Quiz – The last Thursday of term saw the whole school taking part in an inter-house quiz under the stewardship of Mr. Hulme and Dr. Caley. This was a very closely fought competition with Maree House winning the event overall. Krypton Factor – To round off the term with an instructive and challenging event Mr. Johnston, with the help of many other staff, planned and organized an event to promote team building and cooperation amongst pupils across different age groups. The challenges included a series of events covering observation skills, mental agility, mental arithmetic, bike skills, strength and fitness. Kerry got the most points, Maree came second and Tollaidh were third. Mr. Caddell was particularly pleased to see his House triumph on his last day in school. This event was very successful in spite of a surprising number of pupil absences. Indeed it was proof of the concept that giving responsibility and skills of this sort to pupils is valuable as many of the younger pupils stepped up very successfully and led their teams in the absence of older pupils. Click here for some photos. 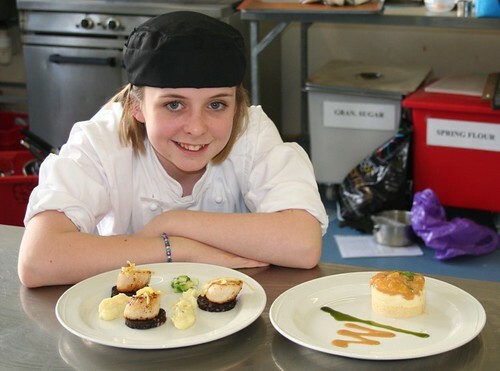 FutureChef – Congratulations to Rosie Smith who won the School Heat and then Local Area Heat of this cooking competition and now goes on to the Regional Final in Inverness on 14th January to aim for the Highlands & Islands FutureChef Champion 2009. Certificates and badges will be presented to all eight pupils who took part in the school heat including Gemma McLean, Isla Mackenzie, Donald Mackenzie, Callum Vickerstaff, Charmayne Fraser, Leah Kenny & Ella McDonagh. Click here for some photos. More Pupil Success – Katrina Port has won a commendation in a national environmental photographic competition for Secondary Schools. She received her award at a presentation held at Dynamic Earth in Edinburgh on the 18th December. Her photo will travel around Scotland as part of an exhibition. Winning photos are available here. Well-done Katrina! We wish former pupil, Zoey MacIver, all the best as she heads off for China. We hope to report on her progress as she teaches Gaelic and piping over the next six months. Indoor Rowing – Culloden Academy visited on Tuesday 9th December to take on S1, 2, 3 and 4 pupils at Indoor Rowing. We are pleased to report that, despite a good standard of competition, Gairloch won all of their races with solid, gutsy efforts. The performances of the S1 girls and the S2 girls were especially encouraging. They are definitely punching above their weight! After the team competition, there were some races for individuals. Some of the senior boys are also showing real strength, with several having broken the magic 1 minute 40 seconds time barrier for 500m. Click here to see some photos. Handball – Gairloch took part in a three-team handball tournament at Millburn Academy on the 15th December along with Millburn and Inverness Royal Academy. Read more by clicking here and see the team photo. The team (Anna Hulme, Flora Stevens, Gemma Urquhart, Judith Matheson, Mags Matheson, Gavin Gourley, Calum Vickerstaff, Conner Easby, Nick Stein, Kenneth MacLennan and Capt. John Allan) train weekly with Ross Mathieson in the Leisure Centre. Thanks also to Mr Hulme and Dr Shearer for their help organizing the trip to Millburn. Global Link School – At the beginning of November, Gairloch High School officially became a link school with Mlozi School, Dedza District, Malawi. This link will enable pupils in both schools to learn about each other’s lives and exchange information. It is hoped that the Primary Schools in the area will also become involved. Our first letters from Malawi came in mid-November and pupils will have the opportunity to reply in January. Information about our link school is on display outside the Library entrance. Read Dr Caley’s notes of the trip here. S5/6 Prelims – Pupils in S5/6 have been working with their teachers preparing and planning for their exams, which start on the 27th January. They have been given appropriate materials for their subjects and advised about the steps they need to take to achieve their best grades. We would ask that parents support pupils in preparation for these important exams. Upcoming dates – 16th Jan – S4 reports issued, 22nd Jan – S4 Parents’ Evening. French Trip installment of £100 is due in by the end of January. More important dates here.